Wrestlemania 7 found the World Wrestling Federation in full-blown patriotic mode. With the Gulf War in full-efect and American turncoat/Iraqi-sympathizer Sgt. Slaughter riding high as the WWF Champion, it was up to The Immortal Hulk Hogan to wage war on behalf of the United States and bring the title home. Luckily, he had the red, white and blue on his side. The whole of the LA Sports Arena was adorned in the Stars and Stripes and the crowd were ready for what would turn out to be one of the better Wrestlemania shows in recent years. 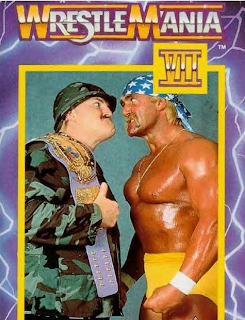 As per the Wrestlemania tradition, Wrestlemania 7 began with Vince McMahon growling his head off over a series of graphics, this year's depicting both WWF Champion Sgt. 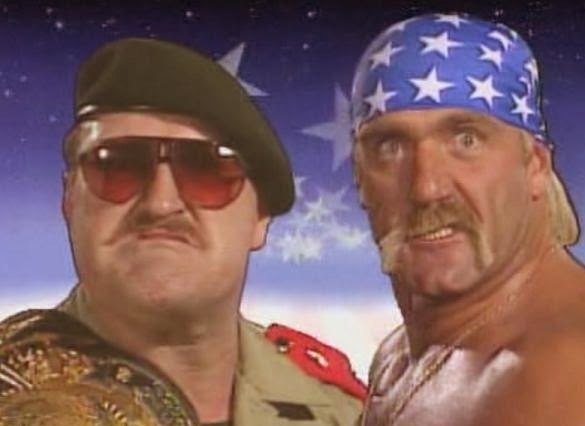 Slaughter and challenger Hulk Hogan snarling at each other against a Star-spangled backdrop. We then went quickly to Willie Nelson for a rendition of America The BEautiful which at least trumped Rockin' Robin's effort of a few years prior. Wilson, decked out in an array of WWF Merchendise, then left the ring as our host fotr the evening, Gorilla Monsoon, picked things up. Before their opening match against Haku & Barbarian, Shawn Michaels and Marty Jannetty gave an interview to Sean Mooney. 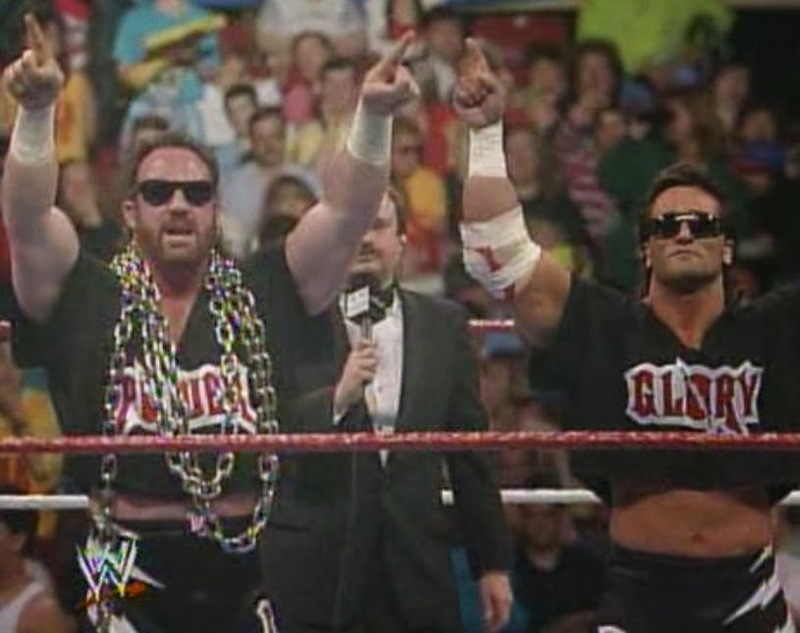 If you'd heard one Rockers ppv promo, you'd essentially heard them all, and this was no exception. 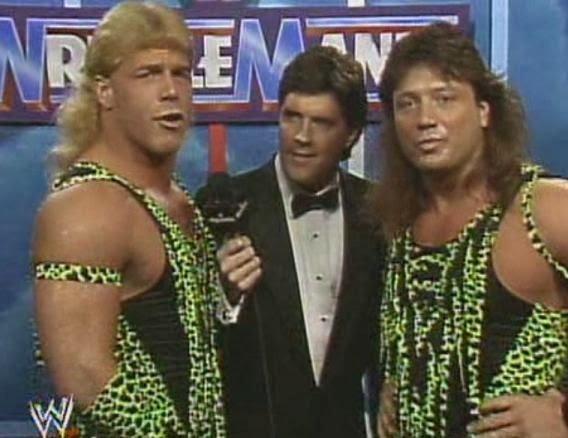 The Rockers reminded everybody that they were 'tag team specialists' and that they were ready for their opponents. And so the seventh annual Wrestlemania show got underway with Bobby Heenan's makeshift team tearing up the ring with perennial crowd-pleasers, The Rockers. I've said before that I'm yet to see a bad pay per view match featuring Michaes and Jannetty, and this opening contest certainly keeps up that tradition. 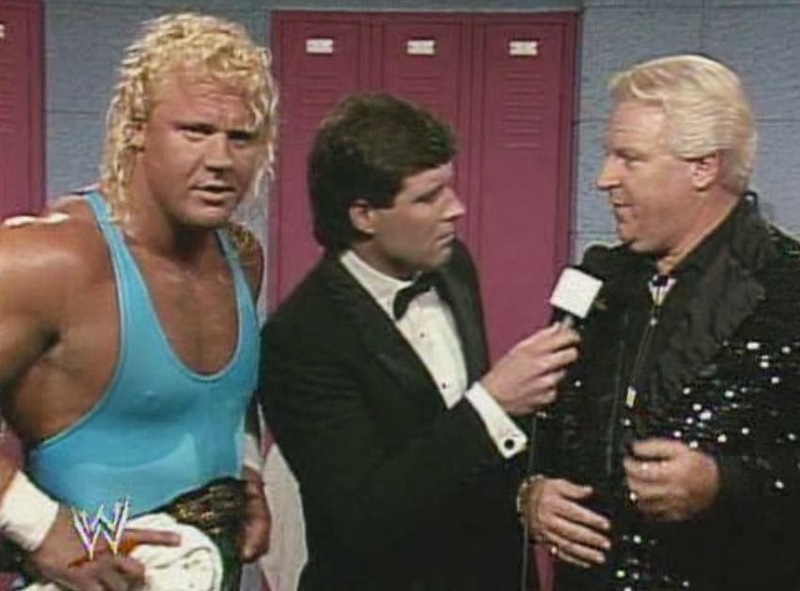 This was a thrilling opening match in which Heenan's family members pitted their size and strength and against the speed and agility of The Rockers to create an exciting, exhillerating bout which got the crowds pumped up and ready for more. After 10 minutes of solid back and forth action, The Rockers went over for the win. Backstage, Mean Gene Okerlund interviewed our three celebrity guests for the show; Regis Philbin, Alex Trebek, and Marla Maples. Philbin claimed to be scared of Earthquake after he saw him, and I quote 'tip over a pizza hut delivery truck and eat everything inside', Marla Maples tried to keep her massive jaw from touching the floor, and Trebek stumped Okerlund with a Jeopardy-themed question. It was neither good nor particularly bad, just one of things that McMahon liked (and still) likes to use to kill up time on his pro wrestling shows. If things had turned out very differently, Kerry Von Erich could (and probably should) have been a huge star on a par with Hogan or Ultimate Warrior, if not at this stage of his career, then certainly within a year or two. Instead, he was trapped in a slow, sluggish, though thankfully short enounter with a Dino Bravo who had long since stopped doing anything useful in the WWF. Several minutes from the opening bell, the Tornado put away his opponent with the Spinning Tornado Punch, and that was all she wrote. Backstage, Sean Mooney spoke to The Warlord and his manager, Slick. Both men claimed that The British Bulldog would fall victim to Warlord's impressive Full Nelson finisher when they met in the next matchup. 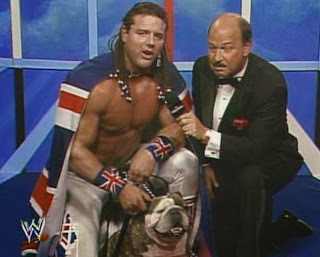 Offering a retort, Davey Boy Smith, accompanied by his pet bulldog Winston, promised that not only would he break out of the Full-Nelson, but he would powerslam his rival into oblivion. He then conferred with Winston and came out with the line 'There's no bull...in this bulldog' before grinning from ear-to-ear as though that were the smartest thing he'd ever said in his life. Judging by clips like this, it probably was. I seem to remember that Davey Boy Smith spent most of 1991 battling The Warlord. They would certainly meet again at This Tuesday in Texas, and I'm almost certain that, in the course of writing these pro wrestling reviews, I'll review at least one more Bulldog/Warlord clash before all is said and done. In a nutshell, this was every Bulldog/Warlord match they ever had; better than you'd expect until Warlord slapped on his Full Nelson and Davey Boy predictably broke it off after both men stood there, selling the hold for a thousand years. Don't let that put you off though, this was an entertaining contest which showed the Bulldog to be a fine pro wrestler with a talent to be envied by his less skilled contemporaries. Much like he often would, the Bulldog scored the win with the Powerslam following eight minutes of solid action. 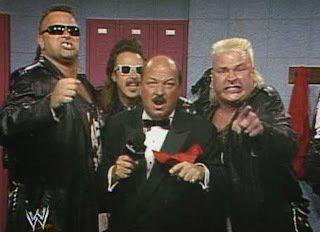 Backstage, The Nasty Boys told Gene Okerlund that they were going to 'rock the foundation' when they met The Hart Foundation for the WWF Tag Team Titles. They also said the word nasty n aful lot and blew their nose on Okerlund's hankerchief. This was your typical Nasty Boys promo, complete with lots of shouting and little sense. Offering a retort, WWF Tag Team Champions Bret Hart and Jim Neidhart warned Brian Knobs and Jerry Sags that they didn't have what it took to dethrone them. The crowd (including then very-young Home Alone star, Macaulay Culkin) were on fire for this fast-paced, hard-hitting battle bettween two of the WWF's most popular tag teams. Though you'd imagine most of the credit for this high-octane bout going to future superstar The Hitman, it has to be said that all four men worked hard to deliver a highly entertaining, completely engrossing battle which came to an end with a loss for The Hart Foundation. 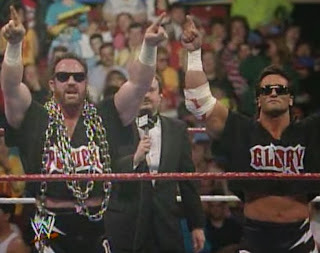 After the champions struck Knobs with The Hart Attack, the referee, Sags came in with Jimmy Hart's helmet, struck The Anvil and stole the tag team titles from the Hart Foundation in what would be their final pay per outing. After Wrestlemania, the Harts would go their separate ways. The Anvil would eventually form The New Foundation with Owen Hart and as for The Hitman..well, let's just say he didn't do too badly. Before our next contest, we were treated to a recap of the feud between Jake 'The Snake' Roberts and Rick 'The Model' Martel, all of which revolved around Martel spraying a little bit of perfume in Roberts' eyes and Roberts subsequently being blind for the next several months. 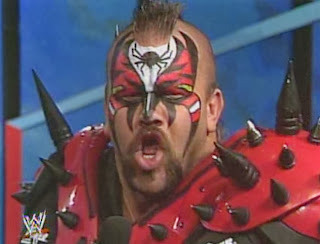 All of this, of course, led to one of the more infamous matches in Wrestlemania history. Chances are, you've heard more bad things about this match than you've heard good. You've probably been told how awful it was, how little action there was, or what a complete waste of time this whole debacle really was. In all honesty, it's really not that bad. OK, so it is. As a television viewer, there's only so much fun you can have watching Jake Roberts walk around the ring with a bag on his head, occasionally pointing around the ring and getting the crowd to help him find Martel. As a live spectacle though, you have to imagine that those in attendance at Wrestlemania VII had a blast as they played a pivitol role in helping Roberts, the hero, finally defeat the dastardly Rick Martel. And defeat him he did, using his patented DDT after eight minutes of walking around the ring and pointing. 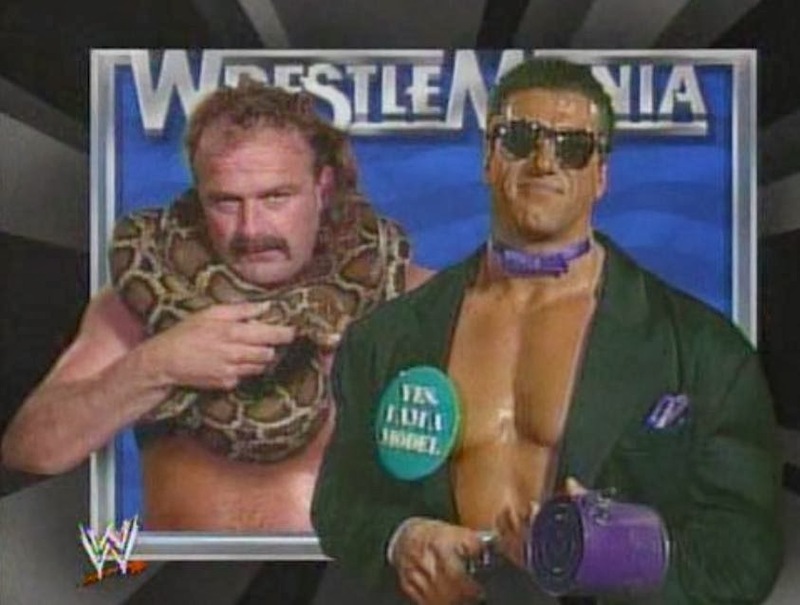 Afterwards, Roberts 'put his snake on' Martel and frightened The Model away. Backstage, Marla Maple's jaw attempted to interview new tag team champions The Nasty Boys. 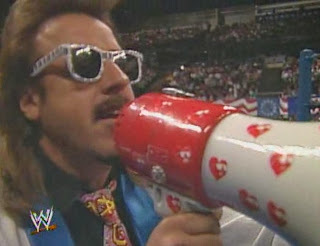 Instead, the new champs yelled and screamed and poured champagne everywhere along with the rest of Jimmy Hart's clan (namely The Mountie, Earthquake and Dino Bravo). Maple and her epic chin got not a word in. There was nothing much to see here. Undertaker annihilated Jimmy Snuka in a short, decent-for-what-it-was squash match which would be entirely forgetabble where it not for historical significance. After four-plus minutes, Superfly ate a Tombstone Piledriver and The Undertaker was 1-0 at Wrestlemania. 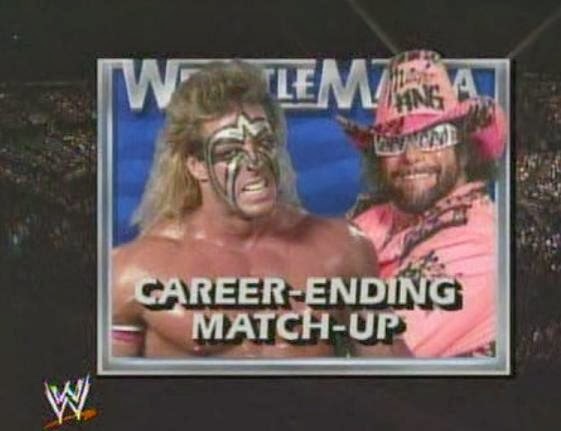 Up next, we got a look back at the rivallry between The Ultimate Warrior and Macho King Randy Savage, a rivallry which began on an episode of Saturday Night's Main Eventi bac in November 1990, carried on through the 1991 Royal Rumble when Savage cost Warrior his WWF title, and led us to tonight, in an unforgettable Retirement Match. Right from the very outset, every single detail of this match told you it was important, beyond important, epic on a grandscale and possibly the most important thing to ever happen in a pro wrestling ring. As we were preparing the arrival of the combatants, Bobby Heenan pointed out Miss. Elizabeth, no seen since Wrestlemania VI, sitting in the crowd. Then came Savage and Sensational Queen Sherri, sitting on two thrones on a platform and carried to the ring by a group of jobbers. Ultimate Warrior's music struck and, rather than bombing his way to ringside at the speed of lightning, he walked, slowly and deliberately to the ring, selling the importance of what was billed as a career-ending match for one of the two combatants. With the excitement, the tension and the electricity all threatening to spill over, out of the ring, out of the arena and onto the streets of LA, the bell rang, and one of the greatest Wrestlemania matches of all time was officially underway. Though it would be tempting to place all of the credit squarely on the shoulders of the always-flawless Macho King, that just wasn't the case in this thrilling, dramatic affair. All three stars, Savage, Warrior and Sherri worked tirelessly to create an engrossing, completely captivating match which could have easily taken the place of Hogan/Slaughter in the main event. Having been battered and beaten by Savage, and struck with not one, not two, but five of the Macho King's patented top-rope elbow drops, Warrior still kicked out, mounted a comeback and hit his rival with his gorilla press slam/big splash combo. To the shock and awe of the LA faithful, Savage kicked out. Questioning the Gods above, convinced that there was not hing more he could possibly do to win the match, Warrior contemplated leaving, only to be attacked by Savage and brought back into the match. Savage battered Warrior, Warrior battled back, regained control, drilled Savage with three devastating shoulder tackles, and pinned him for the three count. Yet the drama wasn't over yet. Sherri made her way into the ring and began kicking the hell out of Savage, distraught at having lost her meal ticket in the World Wrestling Federation. Having seen enough, Miss Elizabeth raced from the crowd to the ring, tossed Sherri out, and had an emotional reunion with the Macho Man which left not a dry eye in the house. Cut to camera shots of people crying in the crowd, hugs between Savage and Liz, and you had the very definition of a Wrestlemania moment. Even your usually hard-hearted writer will admit to getting choked up by the ending of this one. It was perfect. 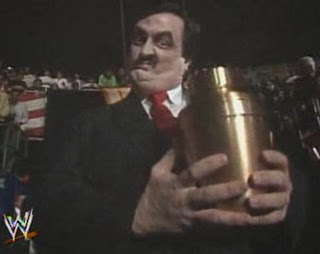 Heading to the back, Regis Philbin attempted to interview The Undertaker and Paul Bearer. Neither man said anything, instead they took their interviews measurements, presumably for a coffin. Philbin then attempted to interview Genichiro Tenryu and Kōji Kitao, again, silence. Back to Trebeck and interview with Jake Roberts. The man with the microphone was scared of Roberts' pet snake, Damien. The words horrible comedy spring directly to mind. There are few people who could have entered the ring following that epic Savage/Warrior clash and completed in an enjoyable match. Sadly, Smash, Crush, Tenryu nor Kitao were such people. What we got here was a short, forgetabble nothing match with a win for the imports from the shortlived Super World of Sports promotion. Backstage, a svelte-looking Big Boss Man said that Mr. Perfect had hurt his momma's feelings by insulting him (aww) and that he was going to get revenge by taking Perfect's Intercontinental Championship. Offering a retort, Perfect and manager Bobby Heenan scoffed at Bossman's threats with Perfect listing the things that made him the perfect champion. This was an awesome promo from the two. With Heenan at ringside managing the champion, Gorilla Monsoon was joined at the commentary booth by Lord Alfred Hayes for this match. 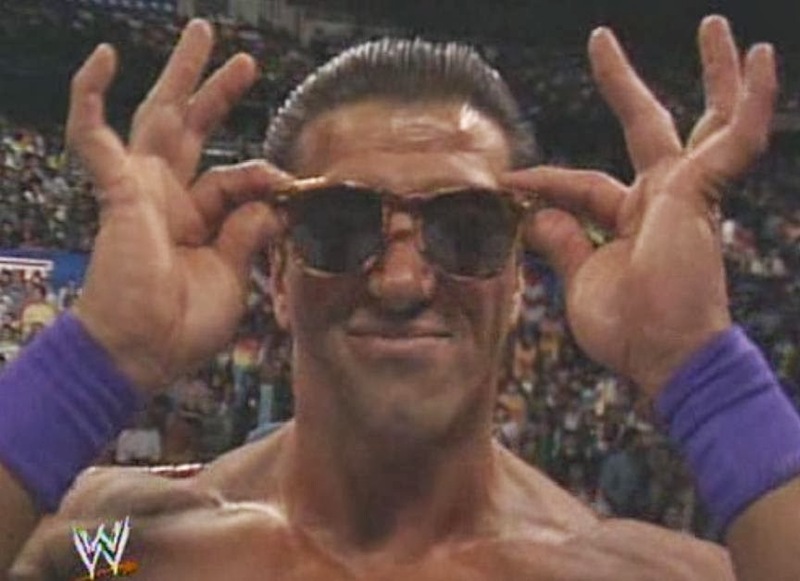 Thankfully, Hayes was much more animated here than he was at Wrestlemania 1. As for the match itself, what we got here was another forgettable contest in which both champ and challenger fought tooth and nail over the WWF's secondary title. The finish came when Haku and Barbarian ran in and attacked Bossman, giving the win to the challenger via DQ. In the post-match shenanigans, Mr. Perfect fell over and Big Boss Man celebrated with Andre. Question: What do Donald Trump, Chuck Norris, The Fonz and The Incredible Hulk all have in common? Answer: They were all sitting together at Wrestlemania Seven and were interviewed by Mean Gene as Earthquake made his way to the ring for the next match. Having broken away from Rhythm & Blues, Greg Valentine was working as a babyface during a period of career that nobody remembers. They probably don't remember it for good reason, for it was during this period that Valentine had atrocious matches like this short, sloppy squash match against the Big Earthquake. Quake won in less than four minutes by sitting on his adversary. Out in the back, Sean Mooney spoke to The Legion of Doom. Both Hawk and Animal were cross the Power & Glory had cost them a shot against the Hart Foundation for the tag titles, and were out for revenge. And revenge they got, in a short and sweet squash match lasting less than one minute. 50+ seconds into proceedings, Hawk and Animal struck a Doomsday Device on Paul Roma, and this one was all over. 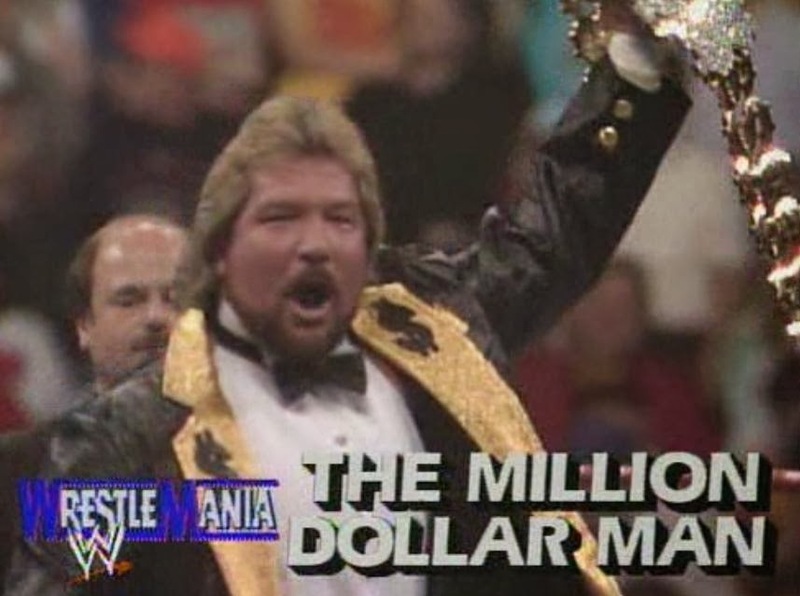 Up next, we got a look back at the break up of The Million Dollar Man Ted Dibiase and his bodyguard Virgil, and how Rowdy Roddy Piper somehow managed to get himself involved. Piper, on crutches following a motorcycle accident, came out before Virgil, then introduced his man to the LA crowd. Needless to say, Piper was infinitly more over than the man he was tasked as seconding, and would remain so throughout the encounter. That's not to say that Virgil didn't get any love from the Los Angeles crowd. 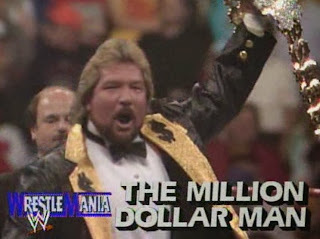 In the opening moments, as he rattled Dibiase around the ring with rights and lefts, the crowds were firmly behind him. Dibiase, for his part, did a wonderful job of selling for his former bodyguard, helping to create an entertaining, if hardly spectacular bout. Towards the finish, Piper once again rose to his feet to steal the spotlight, and was responsible for The Million Dollar Man being counted out. In the post-match, Dibiase attacked Virgil. Piper came to the rescue, only for Sensational Sherri to head to the ring, attack Piper and join forces with the Million Dollar Man. 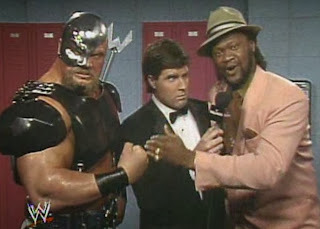 Virgil then came to the rescue, and Piper slowly crawled to his feet to the delight of the audience, stealing the thunder from both Virgil and Dibiase, and giving the crowds their first real reason to go nuts since Savage/Warrior. Before we got back to the ring, we got some final pre-match words from Sgt. 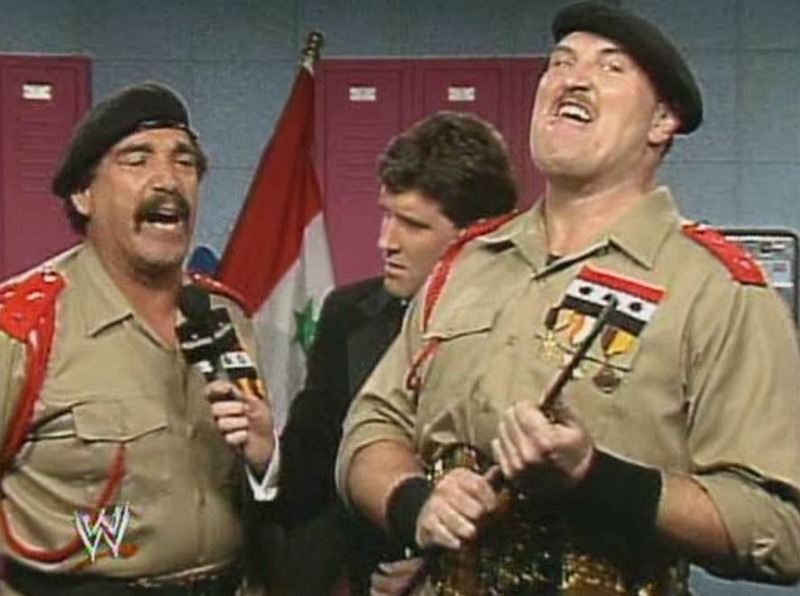 Slaughter and his rambling mad man of a manager, General Adnan. Slaughter claimed that he was playing by his own rules, and even threatened to get himself counted out in order to retain his championship belt. This lasted less than 90 seconds and was entirely pointless. The Mountie won. 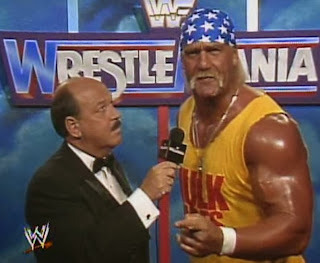 Offering a response to the champion, number one contender Hulk Hogan, complete with Stars and Stripes bandana, cut a scathing promo in which he promised to defeat Slaughter and reclaim the title. 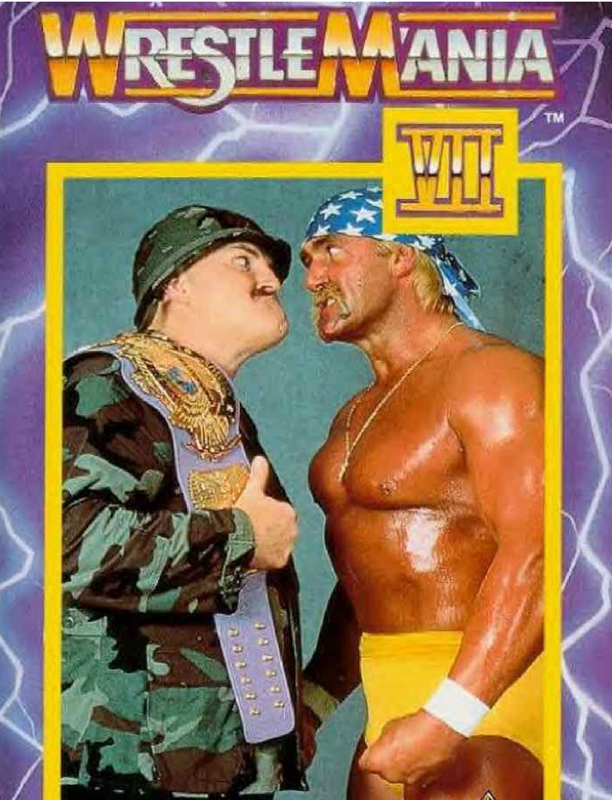 Though Hogan had fought in better Wrestlemania main events (see Wrestlemania 5 and Wrestlemania 6 for example), this was none the less a solid, well-paced match that delivered that all-important big match feel. Following a long, hard-fought slog which saw Hogan get busted open and don the proverbial crimson mask, slaughter's rain as WWF Champion came to an end at the hands of the Immortal One. A good, entertaining brawl which capped off one of the better Wrestlemania shows in the first ten years of its existence with Hogan's hand once again raised. Afterwards, Hogan celebrated with his new title to send the crowds home happy. Wrestlemania VII was arguably a show of two halves. Everything up to the conclusion of Savage/Warrior was strong, enjoyable and exactly what a big-time pay per view should be. In fact, if the seventh annual Showcase of the Immortals ended with Savage and Miss. Elizabeth walking off into the sunset, you could say this was the perfect show. Instead, we then got a second half, a half full of squash matches, dud matches and other filler that nobody cared about and even less remember, all of which killing time until Hogan and Slaughter met in a bloody, hard-hitting brawl. The crap in the second half spoiled things a little, but this is still a good pay per view worth watching for Savage/Warrior, the tag team title match and the Rockers' opening match if nothing else. It's a good thing Vince finally stopped cramming 14 matches into every WrestleMania, as half of them were throw-away matches that last under 3 minutes. By 1992, the matches would be streamlined, thus they could have more time to tell a better story, and a higher majority of the matches could have better storylines and meaning. On a side note, in the aftermath of the DiBiase/Virgil match, Piper threw his crutch and hit referee Danny Davis in the groin.